The Famous New Orleans 'Rock N Bowl' at Mid City Lanes on Carrollton and Tulane. Many people go to hear the music but many go just to bowl. 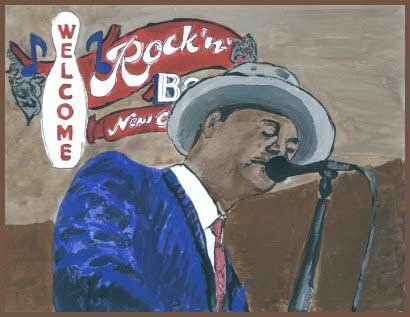 This is my rendition of 'Blues Singer at Rock N Bowl' for sale at $29.99 per 8X10 print plus postage..
One of the oldest chess club/college bars turned into a celebrated music venue 'Maple Leaf Bar' on Oak St. off Carrollton Ave. has live music nightly. 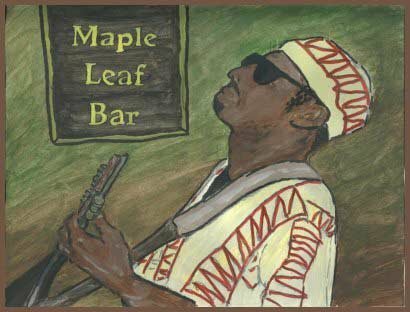 This is my rendition of 'Jazz Guitar at Maple Leaf' for sale at $29.99 per 8X10 print plus postage. Click Image to Order. 'Jimmy's Club' across the street from the streetcar barn on Willow Street. It is a simple building with a lot going inside and how neat that I saw the street car's reflections in the front door glass! 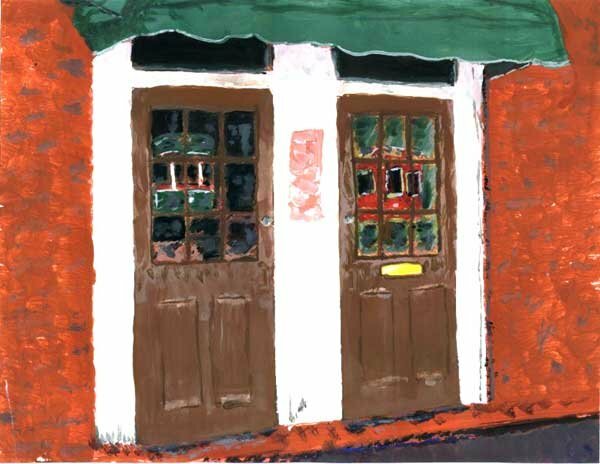 My rendition of 'Jimmy's Club, New Orleans Sounds Inside' for sale at $29.99 per 8X10 print plus postage.. Click Image to Order. 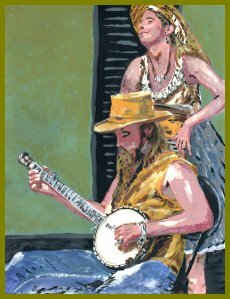 'The Banjo Player" from a group of street musicians on Royal Street 2002. Original is 8X10 acrylic on paper, print is 8X10 costs $29.99 plus postage. Click on image to order. Copyright 2002 by Artist JK Schwehm.